In his first collection of poems, Tennessee Landscape with Blighted Pine, Jesse Graves takes the reader on a personal tour of the places that inform his memories, his character, and his poems. Graves skillfully guides his reader through cities as diverse as New Orleans, Ithaca, NY, and Wrightsville Beach, NC, managing to locate in them one common denominator—all their roads lead back to Sharps Chapel, Tennessee, the hardscrabble home place of the Graves family for centuries, people who are as much a part of the topography of Sharps Chapel and this book, as the native trees and rivers that course through the lines of Graves’ poems. somewhere now under the lake’s gravity. This, like many of the poems in Tennessee Landscape is representative of Graves’ connection with his history, his family, and his home, as well his recurring wish to better understand those people and places that are part of him though they existed long before him. Although Morgan likely has the most direct influence on Graves’ work as his advisor, instructor, and mentor at Cornell University, Graves’ themes of familial relationships, connections with previous generations, and ties to the land are more reminiscent of Marion, particularly the poems of his own early collection, Out in the Country, Back Home. There can be no question that this similarity is the result of not only a close friendship between the two poets, but also the proximity of the home-places from which each of them draws inspiration. Before that Baden-Baden and the Palatinate. Tall fescue and cleft hoofprints of deer on the muddy banks. Here they would harvest what grew, tear life out of the ground. How else do we feel our names when no one speaks them? After running through the grass? Alone in the field, and never alone. Quiet and not quiet. 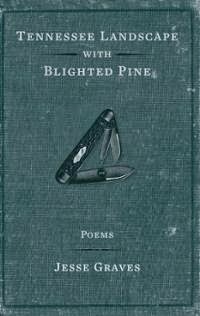 Perhaps more than any other poem in the collection, “Tennessee Landscape with Blighted Pine” embodies the spirit of this collection of poems, making it an appropriate choice for the title poem. arriving like the wet shadows of clouds. splintered legposts jutting from waves. crescent moon imprint, blood tattoo. Harmless on my desk beside a picture of you. In my misplaced journal of those seaside days. Tropical depression bearing in off the coast. Though the bustling streets of New Orleans and the coast of North Carolina bear no resemblance to the mountains of East Tennessee, Graves relies on his affinity with nature to guide him through the lines of these poems which describe a landscape far different than the one of his youth. Graves embraces the gifts nature offers in a moment, realizing (like A.R. Ammons) that he can never take the exact same walk on Wrightsville Beach again. Same as she did my father? She kneaded into dreams for her sleeping children? Song I’ll never hear, white peg bent to silence. Jesse Graves says of his own work, “I think that whatever is most deeply ingrained in a poet is his or her truest subject matter.” Clearly the fields and rivers of Sharps Chapel, Tennessee and the people who made this place his home are most deeply ingrained in this poet and certainly in the pages of this book. Whether looking back to an idyllic childhood filled with “Cokes,” and “bags of peanuts” at “Big Ellum Point,” or questioning his role as an adult in the home on which he places so much importance, it is this connection to family and home, this sense of questioning one’s place in it, that draws me as a reader. His poems deal almost exclusively with landscape and nature in some way, particularly those places associated with having grown-up in the country. Graves, as I do, represents the generation of Appalachians whose families clung to an Agrarian lifestyle, but didn’t depend on it for their livelihood, who broadened their horizons in Detroit factories or behind the wheel of north-bound semi-trucks, but were back home on Sunday for preaching and dinner. We are a generation who, in many ways, must dig deeper to discover our roots and determine where we fit in a place where values, morals, and traditions struggle to keep up with the changing attitudes of people. This sense of questioning in Graves poems appeals to me, makes me feel as though there is a place in the tradition of Appalachian people, of Appalachian poets for those of us who chose to construct our heritage differently than the generations before us. Catherine Pritchard Childress lives in the Appalachian mountains of East Tennessee. She received her M.A. in English from East Tennessee State University, where she served as editor of The Mockingbird Literary/Arts journal. Her poems have appeared or are forthcoming in North American Review, The Connecticut Review, Louisiana Literature, Cape Rock, Still: The Journal and Town Creek Poetry among other journals and have been anthologized in Southern Poetry Anthology: Tennessee Poets.